Sending a parcel to Romania doesn’t need to be daunting. With an extensive courier delivery network, DPD Local Online can not only get you the best prices for postage to Romania, we will also make the experience as simple and straightforward as possible. Whether you’re looking for cheap parcel delivery, a fast courier service or just stress-free parcel post, you can be certain that your parcel to Romania is in good hands. As well as the Carpathian mountains, its medieval fortresses, the Black Sea and of course, Dracula; Romania is also home to what Jeremy Clarkson has dubbed the ‘World’s best driving road’ - otherwise known as the Transfagarasan highway. But, regardless of whether you’re sending a parcel to a remote castle or somewhere more cosmopolitan, you can rely on DPD Local Online to get your parcel to Romania in the timescales you need. We’re trusted by millions of senders across Europe, so book your postage to Romania with DPD Local Online today. Do I need to deal with customs when sending from the UK to Romania? 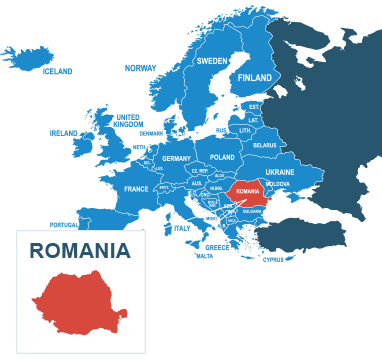 Romania is actually a member of the European Union, subject to the European free trade agreement. That means you won’t need to worry about customs declarations when you posting to Romania from the UK! How much does it cost to send a parcel from the UK to Romania? We’ve worked hard to make postage to Romania as cheap as £18.33 when you book through DPDLocal-Online. Plus, our low prices means that if you find an experss service it will not cost a fortune, so that you’ll never have to book with anyone else! How should I address my parcel for delivery to Romania? There are a few possible ways you can address your parcel to Romania, which might be confusing if it weren’t for this handy addressing guide that the Universal Postal Union have put together to help you. You can contact the Romanian customs office for more information, as well as referring to our own prohibited items page for a list of goods banned by our couriers.